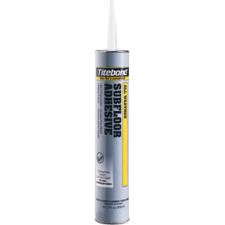 Titebond All Weather Subfloor Adhesive is the ideal choice for subfloor installations. It is designed for particleboard, OSB, engineered lumber and wet, frozen and treated lumber. It offers a strong initial tack, provides superior strength and remains permanently flexible. Titebond All Weather fills gaps and irregularities between materials and provides a more solid backup surface. It reduces the amount of nailing and helps eliminate squeaky floors. It also works extremely well in colder temperatures.